Nine people were arrested this afternoon by the New York Police Department after occupying a vacant lot for over six hours to press their demand that the city use vacant property to house the homeless. The protestors want the city to help turn so-called warehoused property into livable homes for low-income and homeless New Yorkers. A survey conducted in 2006 by the advocacy group Picture the Homeless found that 24,000 potential apartments could come out of warehoused property, enough to house the city’s homeless population. This morning, blue tents were erected on a vacant lot at 115th St. between Madison and Fifth Avenues to create makeshift dwellings for the homeless, as dozens of housing advocates created an festive atmosphere with food, music, art and defiant chants. 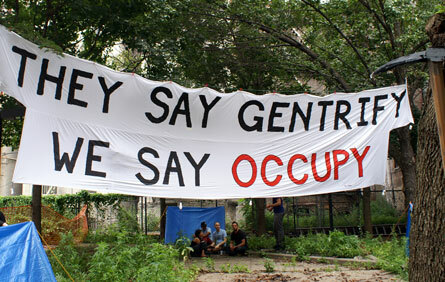 “They say gentrify, we say occupy,” the crowd shouted. The action was organized by Picture the Homeless and the Housing Not Warehousing Coalition. A similar protest outside a vacant building in East Harlem was held last March. “We’re liberating this space for our communities,” thundered Picture the Homeless’ Rob Robinson during a press conference in the afternoon. Robinson was one of those arrested. At the protest’s peak, an estimated 100 people occupied the vacant lot. Groups on hand to show solidarity included Domestic Workers United and Jews for Racial and Economic Justice. Picture the Homeless organizer Frank Morales, who was also arrested, said that this particular spot was chosen because JP Morgan Chase, a bank that the federal government bailed out with $25 billion late last year, is involved with the property. JP Morgan Chase is listed as one of two “parties” to the property by the New York City Department of Finance’s City Register, along with Caparra La Nueva Associates, L.P. The bank, which recently posted over $2 billion in profits, paid back the bailout money in June. A “homeless fashion show” was held earlier in the afternoon before the arrests were made. The police seemed to know of the action in advance, as around 10 stood at the Union Square meeting place, one of two, and followed activists onto the subway. More than two dozen officers were on hand at the protest site. At around 5:30 p.m., officers moved in on the occupied lot and made the arrests, according to Tej Nagaraja, Picture the Homeless’ press person. As housing activists awaited imminent arrest, supporters were rallying and chanting outside the warehoused lot on a sidewalk. “It is manifestly unjust that trillions of dollars are being handed to banks such as Chase while funds are drying up for affordable housing,” said Nathan Nessen, executive director for Jews for Racial and Economic Justice. Councilmembers Tony Avella and Melissa Mark-Viverito are drafting legislation that would target warehoused property to convert units into housing for low-income and homeless people. (To read more about warehousing and the legislation, see “Unlocking the Apartment ‘Warehouse’“). We wanted everyone to know that at 1 AM, the TENT CITY TEN were released from Harlem’s 28th Precinct after 8 hours locked up. All our folks were given desk appearance tickets. We know many of you were interested in doing court/jail support, and that is incredibly awesome and appreciated, but for right now it looks like all we need is for allies to stay tuned. Full details, including testimonies from the recently-released occupiers, are forthcoming. Keep checking the blog, or our twitter (@pthny) , for that information, and info about our NEXT STEPS. My family and I ran into this protest. It looked cool. I wish my neighbors and I would have been invited to be part of this. It was mainly yuppie middle class activists from outside our hood doing their thing. Good luck with your activities. It was great action. I didn’t see the middle class yuppies coming out to support it, maybe they had better things to do. I think that is a very divisive claim to make and one that is unfounded. Take back the land! We across here coming from a different web address plus considered I might as well check it out. We enjoy Gotham Gazette – The Wonkster » Blog Archive » Homeless Advocates Arrested (Update) and everything that We see so I am just following you. Looking forward to looking into the blog page Gotham Gazette – The Wonkster » Blog Archive » Homeless Advocates Arrested (Update) again Plus our prayers go with those in and around Japan we hope your are healthy as well as free from danger Rob Rasner Comic ? What i don’t realize is actually how you’re no longer really a lot more smartly-liked than you may be right now. You’re very intelligent. You realize therefore significantly with regards to this matter, made me in my view imagine it from so many varied angles. Its like women and men aren’t fascinated until it’s something to accomplish with Woman gaga! Your own stuffs excellent. Always care for it up! Keep up the wonderful piece of work, I read few articles on this site and I believe that your web blog is really interesting and contains circles of superb information.